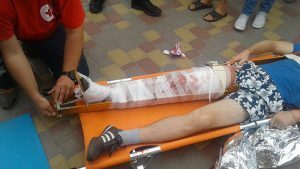 One of the important directions of work performed by the Ukrainian Red Cross Society is to assist emergency-affected people. In case of emergencies, the Society coordinates activities with the public authorities, including the State Emergency Service of Ukraine, Ministry of Health of Ukraine, Ministry of Social Policy of Ukraine. The Society is a part of the national system of emergency response. The President of the Society is a member of the State Commission on Technogenic and Ecological Safety and Emergencies. During preparation and provision of assistance to the affected people, organizations of our Society conduct supporting rescue, medical and social events. Emergency reserves of essential items and food were formed in all subordinate organizations in order to provide emergency assistance to the affected people. Staff and volunteers of the Society across the country actively work with the local subsidiaries of the State Emergencies Service of Ukraine and participate in almost all humanitarian operations of local and national scale.